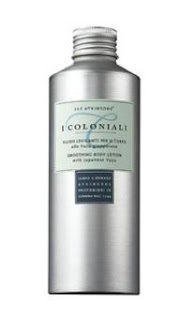 I Coloniali's Smoothing Body Lotion with Japanese Yuzu by J&E Atkinsons will refresh you all summer long! The Yuzu Body Lotion from I Coloniali is absolutely one of my favorite products in the line, especially in the summer. It's cool and refreshing when you put it on after the shower and even as a refreshing pick me up in the afternoon or evening. The Yuzu fruit, originally from China has been widely used in the Orient in religious customs, Since the seventeenth century, it has been recorded as being used in the religious rituals of Japan. It allowed the soothing of chapped skin and its invigorating aroma chased away bad spirits. Thanks to its special delicate and fresh texture this fluid ensures the skin a cosmetic treatment providing it with smoothness and tonicity. Its special formula contains refreshing and smothering agents that make your skin silky, soft and smooth leaving a pleasant freshness sensation.